Jessica Zorge, wildlife program assistant at Tufts Wildlife Clinic, responds to whether to help young animals. Q: What should I do when I find a baby bunny or another wild animal in my yard? A: Don’t rush to help every baby animal. A young animal’s best chance for survival is with its parents, and mothers usually limit visits to prevent predators from finding them. It’s illegal to care for, feed, or keep wild animals unless you’re a licensed rehabilitator. But things sometimes do go awry, so here’s some general guidance about when—and how—you can get involved. And relax—it’s a myth that birds or other wild animals will be rejected by their kin if they smell the presence of a human. It’s normal for baby birds with all their feathers to be found on the ground—they’re learning to fly. And although fledglings are vulnerable, it’s best to leave them alone unless they’ve been injured. The exceptions to this rule are fully feathered baby owls, hawks, and other raptors, which should be assessed by a wildlife veterinarian, because they don’t go through the same fledgling stage as song birds. If you find a baby bird with only some or no feathers, return it to its nest, if possible. If you can’t do that safely, make a temporary nest from a container similar in size to the real one. Drill holes for drainage; line it with grass or leaves (not fabric); tack it up as close as possible to the nest; and monitor it for twelve hours to see whether the mother returns. If not, place the nestling with a licensed rehabilitator. If you find baby bunnies and tons of fur that make it look like an attack has taken place, don’t panic. The mother insulates her nest with her fur, and stays away from dawn to dusk. If she returns, leave well enough alone. 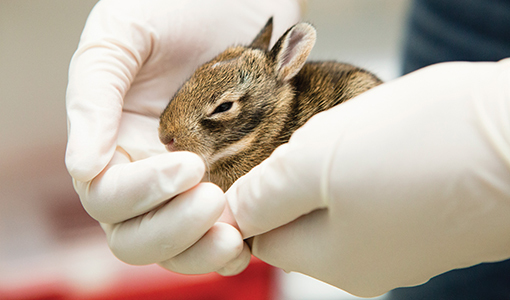 Baby bunnies are notoriously difficult to care for in captivity, and you could do harm by trying to get them to a veterinarian. It’s also not safe to move the nest. If you have a dog, cover the nest with a laundry basket—topped with a heavy object—during times your pet is outside. If you find a baby squirrel with its eyes still closed, it still needs care. Put it in a shallow container at the base of a tree in hopes that its mother will return it to the nest. However, do not leave it outside overnight. Come dusk, bring it inside and call a wildlife rehabilitator or clinic. Whatever the type of baby animal, you can always visit wildlife.tufts.edu or call Tufts Wildlife Clinic at 508-839-7918. We are happy to talk you through safety tips—such as always wearing heavy gloves if you must handle a wild animal—and we can refer you to a licensed wildlife rehabilitator, animal-control officer, or rescue group for further assistance. If you are not sure whether to intervene, our staff also can review cellphone pictures and discuss options. Please email your questions for “Ask the Vet” to Genevieve Rajewski, the editor of this magazine, at genevieve.rajewski@tufts.edu. Because of the volume of inquiries, we cannot respond to all submissions. For any pet health issue, owners should contact their veterinarian.